FRESNO BEE: The gains from a wet January would be erased in the Central Valley if dry and warm weather continues for much of February. Of particular concern is a high pressure system over Central California that would prevent rain and snow from hitting the area. An area of high pressure over Central California means that rain won’t be falling to the Valley floor or snow in the mountains anytime soon, but may instead bring record-breaking temperatures this week. Storms still are brewing from El Niño-charged waters to the far west of the Pacific Ocean but can’t reach the Valley because of the high pressure, bubble-like system currently anchored over the area. 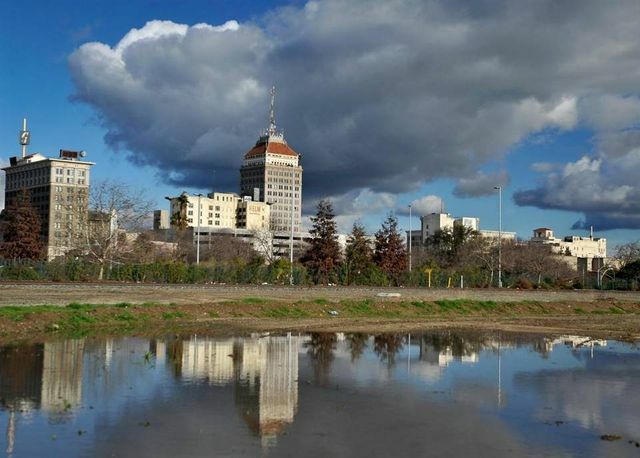 Even with a wet, record-breaking January with more than four inches of rainfall recorded for the month in Fresno, if February remains as dry as it has been, the gains the Valley has seen could be eroded. Last February, Fresno had just an inch of rainfall – about half of what it normally gets for the month. So far this rain year, Fresno has recorded 9.62 inches of rainfall, about two inches short of what normally falls on Fresno in a full year. As the high pressure center continues moving northeast, temperatures will rise above mid-February averages and some records may be broken, the National Weather Service in Hanford said. High pressure systems like this are typical for California, explaining to an extent why it has been so much harder for rain to fall in the central San Joaquin Valley over the last few years – the storms can’t reach us, said William Peterson of the National Weather Service. Although the Valley has been experiencing higher than normal rainfall totals through January, this new weather pattern is more familiar to the Valley, now bringing fog instead of rain. Unusual springlike temperatures will flirt with records this week, with temperatures remaining in the lower 70s. Fresno’s high temperature Monday is expected to hit 70, short of the record of 74 set in 1987. Tuesday’s predicted high of 73 would beat the record of 71 for the date set in 2012. The seasonal average for this time of year is 60. The Valley can expect some moderate fog in the early mornings throughout the week, the weather service said. Although the temperatures are higher than normal, Peterson said some snowmelt in the Sierra Nevada isn’t a bad thing. Rather than waiting until spring for snow to melt all at once and cause flooding in some areas, a more gradual snowmelt throughout the season is better for the central San Joaquin Valley. Even so, warmer temperatures shouldn’t hurt skiing, said Tim Cohee, the general manager of China Peak Mountain Resort near Huntington Lake. With the winter sun still lower in many areas, snow at higher elevations won’t be affected by the higher temperatures, Cohee said.